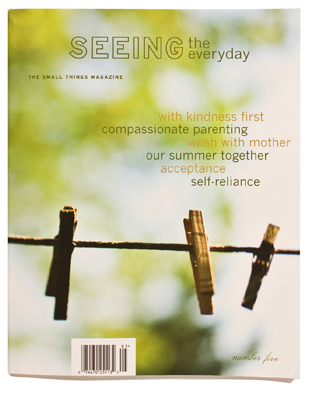 SEEING THE EVERYDAY is a magazine dedicated to revealing the effect and importance of the seemingly small moments of life. True, personal stories and articles unveil how our brief conversations and ordinary, daily rituals contribute to the success of our relationships with one another and to the development of character. The small things we do and say can influence individual lives, forge strong families, and unite communities. I think its safe to say that in the world today times are tough. 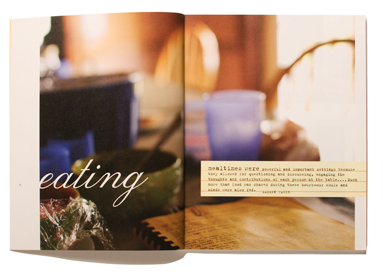 When I opened Seeing the Everyday this month, it was so refreshing to read about the good. Simple and good. I walked away from reading with a little lighter step. Seeing the Everyday was a perfect escape. Beautiful imagery, beautiful stories and beautiful quotes. Stories that brought tears to my eyes, gave me hope in humankind and in good things to come. If you're looking for the perfect gift, that touches a mother's heart, that keeps on giving throughout the whole year, the reminds that there still is so much good in the world, you won't find anything better than this. It's real and it's meaningful. Seeing the Everyday comes quarterly, with no advertisements, just 100+ pages of happiness. Today we're giving away 4 one year subscriptions (a $20 value). Good Luck and Thank You Seeing the Everyday! What an uplifting, beautiful magazine! I would love this for myself, or maybe to send it to my mother! Or maybe both! I've heard of this magazine, and it sounds beautiful! I keep hearing of this magazine. I would love to browse through! This magazine sounds amazing--please help me "see the everyday!" I have been wanting to get myself a subscription and just haven't done it! Maye I'll win! This looks like an amazing magazine! I would love to explore the inspiration between the covers! Wow! I have heard this this magazine is wonderful and being a magazine junkie - I'll have to read it! I've never heard of this, but it looks like a wonderful magazine! I would love to look through it! I also keep hearing about this magazine, but I haven't gotten my hands on it yet. I'd love to check it out! yes please! I have been wanting to subscribe but have not as of yet. i'd love to win! What a wonderful giveaway... I would love to find "seeing the everyday" in my mailbox. Wow, I would love this for myself! This is a great thing for all the women in our family. Thanks for the great tip! I borrowed their last issue from my mother in law and couldn't put it down. I read it cover to cover and had a hard time giving it back! I would love to have a subscription! I'd love this for my Mom in Law, I think that this magazine is probably written for her, or maybe she could write it. Either way, it's up her alley. i've never heard of this mag. what a great gift idea! My mom would love this. What a beautiful idea! I would love to win this magazine. It sounds like something I really do need. I've heard such wonderful things about this magazine. I would love a subscription. This is such a beautiful magazine. I would love this one. Oh wow how fantastic how did I not know about this? As a photographer its great reminder, inspiration! I've heard of Seeing the Everyday - it looks like a beeeee-autiful magazine! So inspiring. Count me in! i have never heard of this but love what i do see! I agree! Beautiful magazine. I'd love to enjoy a yrs subscription!! Sounds like the perfect magazine for me! I have been left with a whole since wondertime stopped this would take the place nicely! I've never heard of this, thanks for introducing me to it! yes, i'd love the magazine! I have never heard about this magazine before! I love the simplicity and the idea behind it! Maybe I'll get this for my mom anyway, I was trying to think of what to get her. - Meg L.
This magazine looks simply delightful! I would love to have a subscription! I just got my copy yesterday and I love it! And I know that cool kid on the swing! What a beautiful and inspiring magazine. i would ADOREa copy of this... I'd love to read it on a rainy day like today, with a cup of warm tea, cozy on the couch! I would love a subscription to this! It looks like a fabulous magazine! I would love a subscription... seems like something I'd love to look through every day. Pick me, pretty please? that magazine seems so down to earth. real. thanks for the opportunity! I know of some friends who who would that subscription! Oh it sounds so simply delightful! I hope I win! I've heard nothing but wonderful things about this magazine. What a great giveaway! Oh, I have heard so much about this magazine! I have cancelled all my magazine subscriptions in the "budget makeover" for me to stay home with the kids. I would love this treat in my mailbox! I saw this magazine the other day and I thought it was a great idea!! Such pretty photos! i've been wanting this magazine for a while. winning it would be great! I love a good magazine! No advertisements? Wow. I'm definitely in! How refreshing. I'm a stay at home mom with and I borrow magazines from the library to cut costs... I'd love this as a mother's day gift.... PLEASE!!!!!!!! I would love this magazine. Enter me! I came across this quote today and was reminded of the impact the state of my heart has on my two little girls. A magazine like this would be lovely to have around the house for those days when I need to be reminded of all that is beautiful in my life, and in the world around me. This on my wish list... oh pretty please!! oooooo!!! Looks SUPER!!!! Love a thick magazine -- especially one w/o ads!! What a beautiful magazine. I have never seen it. Even the cover is uplifting! Would love to read it. This looks so serene and beautiful - I would love a subscription!! Love it! I need this to slowwwwww me down and enjoy. It's amazing how the universe sends you things you are wanting. What a beautiful magazine. Why yes, I WOULD love to win. wow! sounds like a great magazine. Hope I win it! Love the idea of this and I think it could really help me out! I've never heard of this magazine! It looks amazing. I'd love to win a copy ... my fingers are crossed! i've been hearing such good things about this magazine from every direction! would love to win, thanks for the giveaway. I could use some uplifting reading these days. 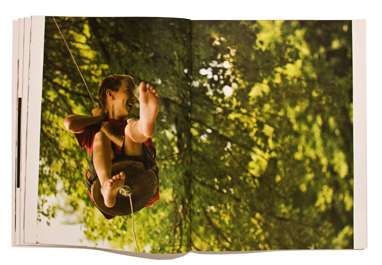 Just love the two page layout of the boy swinging. I think I would like it very much! This magazine sounds like a breath of fresh air. I'd love to win! Looks like a great magazine! I so need this magazine! I've heard how wonderful this magazine is. It sounds beautiful. Just gave your blog a "shout-out" on my wee blog in regards to your recent freezer paper fabric painting tutorial! not only would i love this, but i think i really need this too. please pick me! Sounds great! I love the cover photo! What a beautiful magazine, I would love to be a subscriber. Sounds refreshing. I'd love to win a subscription. Sounds lovely! Would be the one magazine that doesn't remain unread on my nightstand for weeks. Sounds like the perfect little pick me up! I need something like this in my life. What a wonderful concept, and when finished a great gift to pass on to a friend. What an intriguing magazine, I've never heard of it. And don't we need this during this recession. thanks! I would so very much like to try out this beautiful looking magazine for a year! This DOES sound like the perfect gift, for me :) or my mom! Sounds like a fantastic magazine. Who doesn't need something like this? It sounds like a perfect combination of just plain inspiring and a good realsimple mag! Aaaah! What a relief that there are still good publications out there! I would love this! it sounds like such a beautiful magazine. anna hale: vintage betty ring is SO great! Time to read would be VERY nice for Mother's day---this would give me an excuse! wow! What an amazing magazine. Crossing my fingers! This looks like a wonderful magazine! I would love to win. I think this magazine would be very uplifting and help me to chill out when I'm having a bad day. I just bought a subscription for myself last week, but I would love to win one for my mom! I always love a good magazine to read. What a unique looking magazine. I would love to receive it. I would love to win a subscription!! Especially since it's just pure inspiration, zero ads. What a great concept. It would be incredibly refreshing to, once in a while, be reminded of simple and everyday pleasures. Reading this magazine sounds like a great uplifting time. I've heard such wonderful things about this magazine - I'd love a subscription! That looks fabulous! I need some design magazines in my collection! What a lovely magazine. I would love it for myself or my mom!! I've never heard of this magazine. It seems very interesting. Sounds fantastic! Would love to win. i love the vision of this magazine. it embodies how i try to live my life. i've recommended it to several people, without even having my own subscription. that would be loooverly. Oh, how beautiful and inspiring! It sounds like a fabulous magazine, just what we need in today's world. I would love to read his magazine or send it to one of my daughters in law. looks like a great way to encourage us to stop and smell the roses! sounds like a must-have, even for one who avoids most magazines! Would love to have a delight for my day. This mag would fit the bill! That magazine is something everyone needs! How wonderful! Wow I have never heard of this magazine but sounds like something I would LOVE.